1. Preheat the oven to 200°C, gas mark 6. Place the tomatoes, onions and sage in a large roasting tin. Season, then drizzle with the oil. Roast for 20 minutes, or until the vegetables are tender. 2. Pour the hot vegetable stock over the tomatoes and onions and return to the oven for a further 20 minutes, or until soft. 3. 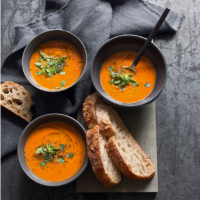 Carefully pour the soup into a liquidiser or food processor and blend for 2-3 minutes, until smooth (you may have to do this in several batches). 4. Reheat the soup, garnish with a little Thai basil and a drizzle of olive oil. Serve with warmed Waitrose 1 Roasted Cauliflower Cheese Sourdough.